Mac, a Scottish Terrier I love back in the U.S., has been feeling under the weather, so today, I’m introducing you to my other favorite dog in the world, Skampy. I’m convinced he and Mac would be great friends if they didn’t live half a world away from each other. They’ve got some shared terrier genes, and tonight while Skampy was on his nightly patrol of Z-ma’s yard, his voice was the same timbre as Mac’s, and it sounds like it comes from a creature larger and fiercer than someone of his size and regular tail waggings. One of the first things I had to learn is that he might look clean but he’s covered with Africa, and one of his goals in life is to make sure that you never leave his company without an orange splodge on your leg. The first time I met him, he leaped up on me and left two paw prints on my shirt. The second thing I had to learn last time I was here is that he is not an American dog. I’d happily brought him one of those big red rubber Kongs that you put treats inside to keep a curious mind occupied. Because American dogs are bored, what with so few of them having gainful employment, Kongs are great ways to pass time. The Kong confused Zimbabwean Skampy. He licked it but couldn’t figure out how to get the treat out of it even when it was rubbed in bacon grease. Ultimately, the two of us were frustrated by the endeavor. I assumed this was a failure on his part, that clearly he wasn’t all that bright, but then Z-ma pointed out that Skampy has real work to do and can’t be bothered with such frivolities like trying to get a treat out of some magician’s trick of a dog toy. Skampy does work hard. All night long. He barks and barks, both to alert people on the other side of Z-ma’s high grass-and-wire fence that he’s around and will eat them alive and to converse with other neighbor dogs. (My best guess is that they are thinking of unionizing, based on the intensity of the barking.) 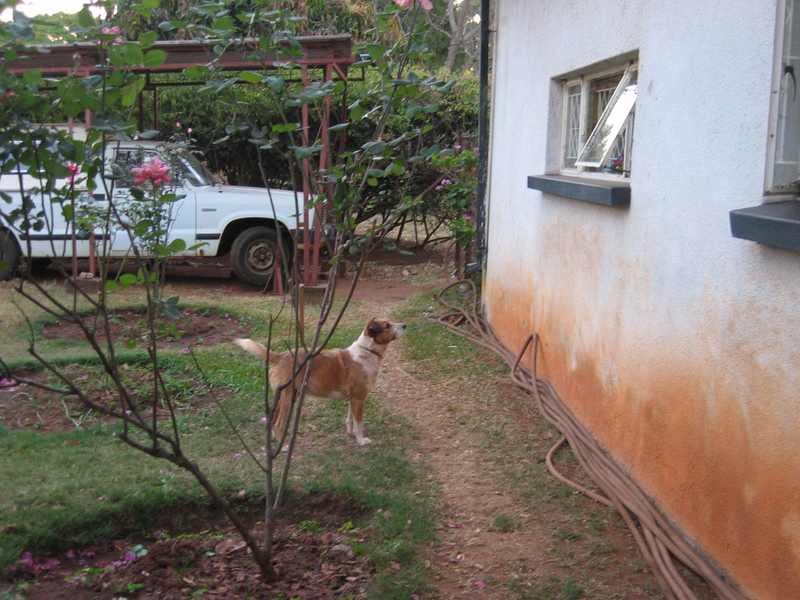 As my brother-in-law mentioned yesterday, in Zimbabwe, you need a high wall and a guard dog as a first alert against would-be thieves. Though we suspect Skampy would just lick and dance for intruders, it is nice to know he’s out there, making the rounds. Unfortunately Skampy and the rooster next door seem to have worked out some sort of agreement wherein Skampy doesn’t stop barking until it’s time for the rooster to crow, so there isn’t a lot of silence here when you want to sleep. During the day, he spends a lot of time in his dog house with his forehead pressed to the cool stones beneath it, as if he’s nursing a hangover. One morning I gave him a piece of bacon and he didn’t even have the energy to lift his head and get it from me. He just stuck is tongue out and “caught” the bacon like a frog would a fly. One of my favorite times of day here is teatime. Around 4 p.m., Z-ma loads up a silver tray with a teapot covered in a red and white tea cozy, a sugar bowl, some milk, a little container with biscuits (human cookies) and a cup of treats (dog biscuits), as well as several pieces of dry bread and a jar of peanut butter, because Dog can not live on Milk Bone alone. We humans sip tea (Coke for me, because I don’t understand hot drinks in a warm climate) and Skampy eats treats. If he finds the treat particularly enviable, he carries it away from us and eats it at a safe distance from us, wary that we’ll decide to take it back. Despite this being on the verge of peek mosquito feasting, I love this time of day, watching the light hit the orchids and succulents in the yard in that slanty way that gives things new life. We sip our drinks and talk about nothing important, interrupting each other to tell the dog what a good boy he is for sitting patiently to wait for his next piece of peanut butter bread. Despite the way my brain tries to categorize stuff and the failure of my words, I’m really not trying to ascertain how one place is superior or inferior to another. I want to understand Z’s Zimbabwe, and at tea, I feel closest to “getting” this different kind of life in this different kind of place. I could decide every day between now and Thanksgiving in Seattle that I’ll have tea at 4 p.m., but it wouldn’t be the same. It isn’t my ritual. Yet when I’m there—despite the Coke I’m drinking—it feels like a practice I wish I could make mine—this delighting in simple pleasures. Unfortunately, I think trying to force it here would just end up seeming wrong—kind of like the little gum-sized squares of turf incense I bought once to try to duplicate the smell of Ireland. There were a dicey few minutes one day when Skampy seemed to have gotten one of the small dog treats we’d brought him stuck in his mouth, so he walked hurriedly around the yard with a worried expression on his face, mouth propped open unnaturally. Z tried to help, but Skampy assumed Z was after his treat, so ran away. Just as Z-ma was prepared to call the vet to solve the problem, Skampy worked out a solution while hiding in the bunker he’s dug for himself just under the lounge window. He popped out a few minutes later, tail wagging, ready for another treat and none the worse for wear. But most days, there was no tea drama. And then, when the mozzies start buzzing around me—most prized guest at their dinner table—we pack up the tray, pat Skampy on the head, and shut ourselves into the house, locking doors, pulling curtains, and preparing for the evening. Dog addendum #1): Yesterday, I discovered that Skampy has a sort of McDonald’s drive-thru window. At certain times of the day, he sits in front of the little kitchen window, barks his order, and Z-ma throws out some bit of dry toast or treat. Apparently he also does this if he smells cooking that he finds particularly appealing. Dog addendum #2): I find it ironic that the first dog of my life was my maternal grandparents’ Rhodesian Ridgeback, Wrinkles. (Zimbabwe used to be Rhodesia, so see, there was always a prominent Zimbabwean in my life. Z just doesn’t have a tail like a whip.) I remember my mother explaining that Wrinkles was a lion hunting dog, and I thought that sounded made up because lions only existed at zoos. Also, while I’m cataloging the misinformation about the breed that I had as a kid, I assumed it was called a Ridgeback because it stood on the back of a hill or ridge in order to leap on top of a lion. I had no idea that these dogs have a line down the middle of their backs that form a sort of ridge. 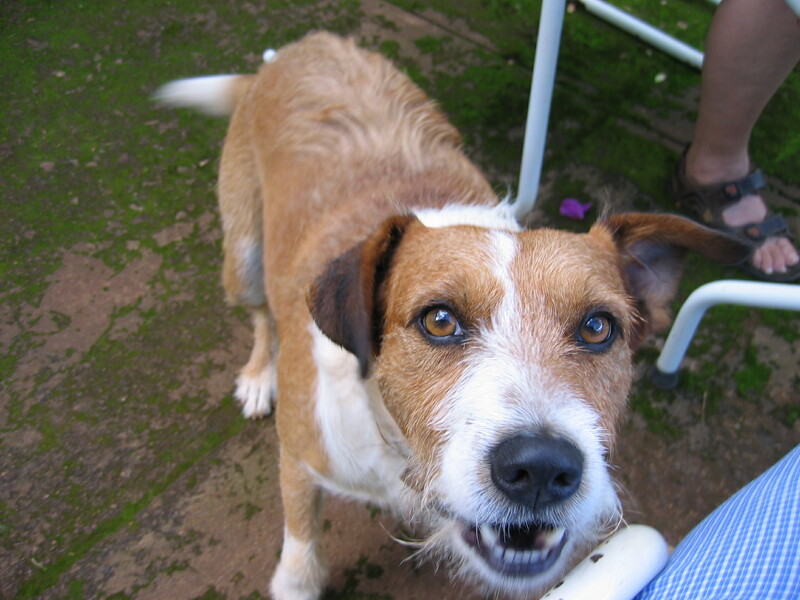 Skampy has a lot of terrier in him, but since he was a rescue, it’s hard to know what’s mixed up in his gene pool. Personally, I think there’s a little Ridgeback despite his overt terrier characteristics because he has this little tuft of fur that runs the length of his spine and isn’t like the rest of his coat. It’s almost like a little backbone toupee made of a bird nest. This is so excellent–you make me “see it all” and feel as if I were there experiencing Skampy and his surroundings for myself. More! My favorite so far! I feel like I know Skampy now and I really like him. He seems to very practical about the matters of his life and has little time for nonsense. Really, really well written! I enjoyed this post so much! Thank you for sharing Skampy with us. I love the photo of him standing expectantly at his drive-thru window. Glad that Mac is feeling better! The part I failed to mention, John, is that Skampy seems to be operated by two independent dogs: one at the front and one at the back, so he regularly as the movements of a hook-and-ladder firetruck. Thanks for reading!